Forget everything you thought you knew about deep sea fishing and come see how the locals do it in Seattle. Here, you can drop lines in the water just minutes after leaving the dock and pull up massive fish without losing sight of the city skyline. 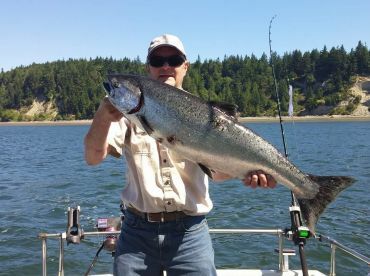 On one of these trips, you’ll never leave Puget Sound and you’ll never fish in water more than 930’ deep. This may be a far cry from what you expected, and farther still from the deep sea fishing available on Washington’s coast. But it’s worth stretching the definition a little, because the deep sea fishing Seattle has to offer puts a unique spin on the concept. Nothing gets local anglers riled up like the Chinook Salmon in Puget Sound. Juvenile Chinook—also called “Blackmouth” Salmon—swim in these waters all year, but you’ll see anglers fishing for them mostly from November through April. These hard-fighting fish peak in the coldest months, providing locals with plenty of blood-pumping action in the dead of winter. The local Salmon season typically closes in April and reopens in June when mature Chinook enter the sound. These large King Salmon are closely followed by Cohos in July, accompanied by Pink Salmon in odd years. 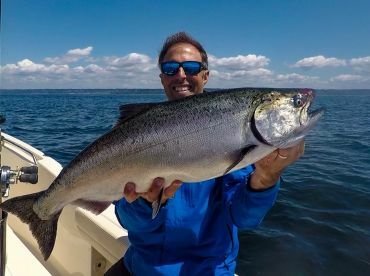 Even when regulations prevent anglers from keeping local Salmon, many continue to catch and release these fish because they provide such great sport. When they’re not fishing for Salmon, anglers in Seattle hook into a steady supply of Flounder. This flatfish is easy to catch and the sound is absolutely riddled with them. You can add Lingcod, Cabezon, and other bottom dwellers to your cooler when the season opens in May. Spend a day fishing in Puget Sound and you’ll see why many anglers compare the experience to classic deep sea fishing. Anglers the world over rely on trolling and bottom fishing when it comes to this technique, and local fishermen here are no exception. 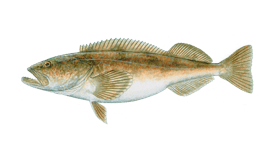 Unsurprisingly, deep sea fishing in Seattle involves a lot of bottom fishing for Flounder, Lingcod, and Cabezon. You can also expect a great deal of trolling for Salmon, but not quite like the surface trolling you’re used to. Locals typically catch Blackmouth Salmon by trolling near the bottom in 100-130 feet of water. Using a downrigger, they manage to target the fish closest to the bottom of the sound, putting the “deep” in deep sea fishing. This method allows anglers to use lighter tackle, intensifying the action when they hook into one of these hard-fighting beasties. Lures such as spoons and plugs or bait like Squid and Herring both work well for deep trolling. Another tactic favored by anglers in Seattle is mooching, a traditional hands-on approach to Salmon fishing. Rather than placing the rods in holders and dragging multiple lines behind the boat, local guides place a rod in every angler’s hands and allow them to drift fish. This way, you can feel the pull as soon as a Salmon strikes. Some locals prefer this technique above all others and passionately advocate mooching over trolling with downriggers. The trick is to constantly keep your bait in motion, dropping it down and reeling it back up again repeatedly. Herring is a popular bait choice for mooching.